In a deep pot or wok (I like to use my wok for this dish); heat the oil over medium heat; add the sausage and sauté until fragrant. Add the onion, fennel and garlic, sauté for about 5 - 7 minutes or until tender but not soft, then add the tomatoes and juice, the bay leaf and red pepper flakes stir well. Add the mussels along with the beer; bring to a simmer. Cook until the mussels begin to open (I like to remove the mussels to warmed bowls as they open so they don't overcook.). Discard any unopened mussels. Divide the broth and all the delicious veggies between the two bowls and serve. Sunday afternoon, working in the garden on a beautiful winter’s day. It’s 72ºF in Sonoma County in the middle of January; how can we resist going outside to play? We can’t. But once you get playing in the dirt, there’s not a good time to brush yourself off and go out to lunch. 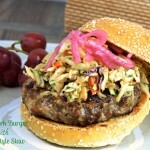 It’s a good time to eat at home, in your own backyard. Since BB and I got our FitBit Charge for Christmas, we have been tracking our food consumption (and there can be no lying or excuse-making when you write each thing down) and we realized that we have been a bit lax in a number of places in our diet. Especially with our lunches out. While BB travels a lot for business, and in his travels is host to a lot of wine/food events, we are always very careful about taking only a bite or two of each dish, leaving much delicious and rich food on the plate. But when we go out to lunch, oft times it’s a burger and fries. A hot pastrami sandwich. Can you say, Rueben? Not exactly “get me thin” food. And like the frog sitting in the pot of hot water not realizing he is being cooked…weight goes on very slowly. Until one day you realize, YIKES…I’m getting fat. When did that happen? So I’m trying to come up with new, healthier options for our at home lunch. Something better than a grilled sandwich, or a chili dog. 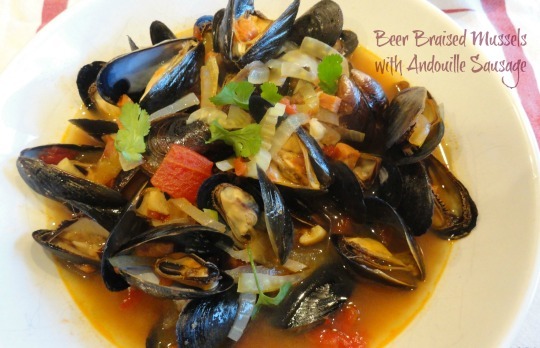 We like mussels… mussels are in season… so I thought of this recipe for Beer Braised Mussels with Andouille Sausage. Mussels are a very lean protein with only 70 calories per 3 ounces of meat and 1.7 grams of fat, so this recipe fits the bill. You can make this with clams if you so choose, but since clam shells are heavy and mussel shells are light, I prefer mussels … you get more for your $$. 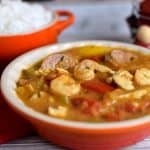 Andouille sausage is a smoky slightly spicy sausage and it gives this dish a lot of flavor. I used al Fresco chicken Andouille sausage. 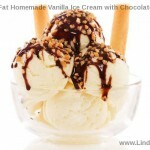 With only 120 calories and 6 grams of fat per link, it gives you all the flavor with less fat. If you can’t find them, use another brand, your numbers will be slightly higher than mine, but still in a good healthy range. Just be sure to get a smoked sausage made with chicken. To give this recipe more flavor, I added some sliced fennel along with onions, tomato and of course, a very flavorful beer, in my case Anchor Steam. You could also use a Belgium Ale, larger, or whatever beer turns you on. Just remember, the beer and the sausage are what is adding the flavor, so be sure to use good flavors up front and you will have good flavors in the end product. This dish was really fast to put together once it was prepped, and the prep time wasn’t long at all; about 10 minutes. LindySez: A perfect low-fat yet satisfying lunch on the patio while enjoying the fruits of our labor, and our chickens, both metal and real. * How to Prepare and Cook Fresh Mussels. Fabulous dish, Linda! 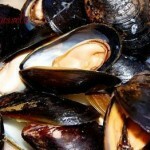 I’ve never tried mussels but am absolutely willing after reading this recipe!! Looks amazing… I have to stop reading your site before lunch. Using al Fresco Sausage, may not be 100% accurate.